Can a form have multiple pages? I want to make a survey, but limit the amount of questions to 3 a page. Is it possible to have three questions on a page and have a next and previous button at the bottom taking you to the next page. Then the last page having a submit which would submit the whole form. Yes, that is definitely possible by using Page Break under Survey Tools. Simply highlight a field or fields you would like to appear in a page then click Page Break. You can do this multiple times. In fact there is a very simple way to do it in the Jotform builder. -While editing your form, in the left side you can find the fields to add to your form, there click on Survey Tools. -Then double click on the Page Break field to add one. -After that put the Page Break field where you want it to be, there you have the first page of your survey or form. (as long as you continue editing your form the Page Break field Will appear like a Bar). 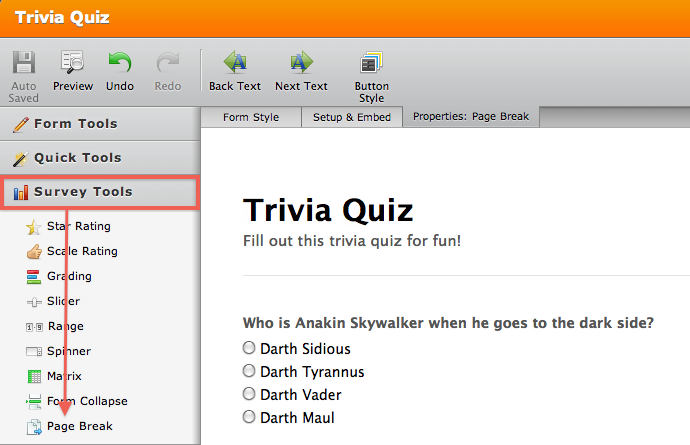 -Then you can continue adding more questions and more Page Break fields. When you finish to edit your form click on Preview in the top left of the builder, and there you will see your form with the page Break with a Next button. You can see a very simple example in this link http://form.jotform.co/form/31365089307860?